My thoughts: I absolutely love this series and this latest installment was not different – absolutely fabulous read! This book takes place is two separate locations – the jungles of Africa and of course Boston! Let me just say that the scenes that take place in the jungles of Africa are horrifying and the more you read, the more you begin to feel as if you are really there living the event – fabulously terrifying! As most readers agree books always tend to be much, much better than the movie or TV show that comes from them. I mostly agree but I will say that I truly, truly enjoy the TNT Rizzoli and Isles TV series . . . and now I can’t read the books without seeing the actresses in the roles . . . which isn’t a bad thing! If you haven’t picked up Gerritsen’s Rizzoli and Isles series, I highly recommend it. You will not be disappointed. A great, fast-paced series with great characters and chilling moments that make you feel as if you are in the book. Miranda Wood thinks she has seen the last of Richard Tremain, her rich and married ex-lover—until she discovers him stabbed to death in her bed. With her knife. Miranda is the obvious suspect, and she looks even guiltier when her bail is posted by an anonymous donor. Was this an act of kindness designed to buy her time to clear her name? Or is someone trying to manipulate Miranda and draw her into the dark and secret world of a murdered man, where everybody’s presumed guilty? With her world falling around her, Miranda is determined to discover who killed Richard. But proving her innocence may become secondary to staying alive. My thoughts: This book was really just ok for me. This book goes back to when the author began as writing romantic thrillers and I must say this isn’t my favorite genre or work of hers by any means. I must say I found the whole premise of the brother of the murder victim getting together with the suspected murderer just a bit odd and ultimately unrealistic in my book, so this got in the way for me. The storyline was alright and moved along rather quickly. I just found I couldn’t get attached to any of the characters in this book. 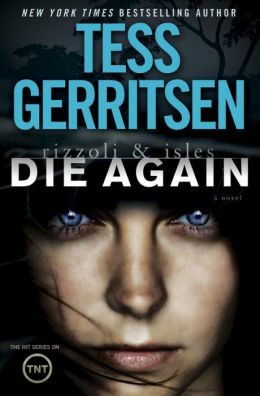 I will be sticking with Tess Gerritsen’s newer books, this one just wasn’t for me! Synopsis (from bn.com): For the second time in his short life, Teddy Clock has survived a massacre. Two years ago, he barely escaped when his entire family was slaughtered. Now, at fourteen, in a hideous echo of the past, Teddy is the lone survivor of his foster family’s mass murder. Orphaned once more, the traumatized teenager has nowhere to turn—until the Boston PD puts detective Jane Rizzoli on the case. Determined to protect this young man, Jane discovers that what seemed like a coincidence is instead just one horrifying part of a relentless killer’s merciless mission. My thoughts: In a word this book was AMAZING! This is now no doubt my favorite Rizzoli & Isles book ever! I have never read a book in this particular series in one day – but that changed with this latest book in this great series! I literally couldn’t read fast enough to keep up with the excitement and my curiosity about where this book was going to go! Wow! This book was fast-paced, suspenseful, jarring, disturbing, creepy, and scary all in one! I found the setting of the Eversong boarding school just plain creepy and a wonderful setting for the secrets of the storyline. I loved that the book brought the series back to Rizzoli & Isles working more together again rather than having each of them sort of featured in their own stories. Just when I thought I had all of the information and the book was heading to a great conclusion . . . bam . . . another plot twist . . . then another body . . . then another twist! Great read! Overall, I can’t say enough about this latest Rizzoli & Isles book! A fast-paced, intriguing mystery that is not to be missed! Thank goodness I have some episodes of Rizzoli & Isles saved on my DVR to catch up on, because now I just can’t get enought. Can’t wait for the next book to come out. Synopsis (from bn.com): In the murky shadows of Boston’s Chinatown lies a severed hand. On the tenement rooftop above is the corpse belonging to that hand, a red-haired woman dressed in black, her head nearly decapitated. Two strands of silver hair—not human—cling to her body. They are homicide cop Jane Rizzoli’s only clues, but they’re enough for her and medical examiner Maura Isles to make the startling discovery: that this violent death had a chilling prequel. Nineteen years earlier, a horrifying murder-suicide in a Chinatown restaurant left five people dead. One woman connected to that massacre is still alive—a mysterious martial arts master who is now the target of someone, or something, deeply and relentlessly evil. Cracking a crime with bone-chilling echoes of an ancient Chinese legend, Rizzoli and Isles must outwit an unseen enemy with centuries of cunning—and a swift, avenging blade. My thoughts: One of the reading challenges that I signed up for this year was the Finish the Series Challenge and this Rizzoli & Isles series is one that I identified that I wanted to finish! It has been quite a while since I finished book #8 in this series – Ice Cold (which incidentally is very, very good as well) – so I embarked on The Silent Girl! I am so very glad that I came back to this series to finish it up! I thought this book was fantastic! I have read the entire Rizzoli & Isles series and I must say, although the others were very good, this one ranks up there as one of my favorites. I must admit that I was a bit reticent at first as I saw that the book was set in Chinatown, only because a while back I read a book by a completely different author set in a similar location that was very confusing and dragged on. Not the case with this book! In true Rizzoli & Isles style, this book featured excitement, suspense, twisting storylines, and great characters! This book had our favorite characters Rizzoli, Isles, Frost, Gabriel, and the like, but also introduced us to some new characters including Officer Tam that I am hopeful will be featured in future books as well. The only small question I had about this book was why Isles wasn’t very prominently featured as she normally is. It seemed her character really took a back seat to Rizzoli in this book and by the end I was wondering where in the world Isles even was. Perhaps it is simply because the last book – Ice Cold – really featured Isles and now it was Rizzoli’s turn 🙂 I do like when they are both working together and you get to see their great friendship and sense of camaraderie. Completely not related to the quality of the book per se, but reading this book reminded me why I always like reading the books before I go to see a movie or watch the television show! As a true fan of this series, I of course have watched the Rizzoli & Isles TV series on TNT and now when I read the books I simply can’t stop from imagining Angie Harmon or Sasha Alexander delivering the lines! I must say that their characterizations on the TV show are spot on, which is not often the case. Overall, a great, fast read filled with suspense, mystery, fast-paced action, and interesting character twists! A must read!